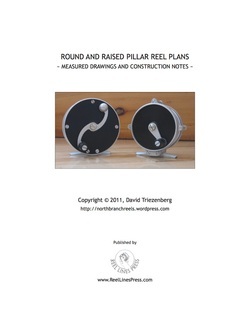 Reel builder David Triezenberg has released Round and Raised Pillar Fly Reel - Measured Drawings and Construction Notes. The plans are printed on high quality 8 1/2" x 11" paper, bound in a clear removable cover. Included are an index, a materials list, 5 pages of detailed construction notes, 18 measured drawings of reel components and fixture drawings (see example photo above), and a table of weights and critical dimensions - 27 pages of information plus a clip cover. Printed in the USA. The round reel is 3.22" diameter and the raised pillar is 2.74" to outer ring, 3.22" to raised pillar ear. The reels are suitable for 4 and 5 weight lines and include a pawl and ratchet check mechanism. The construction notes provide additional details of fabricating the reel parts and fixtures. See David's blog, North Branch Reels, for more information, construction details, photos, and many other interesting reel building posts. David uses a tabletop lathe and mill (Sherline) to fabricate the parts for his reels.